RACINE, Wis. — Jet Edge Inc. announces that JACQUET Midwest has installed a dual head 5-axis Jet Edge EDGE X-5® waterjet cutting system at its metal processing facility in Racine, Wisconsin. 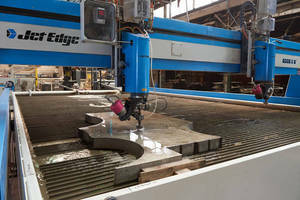 The EDGE X-5 is JACQUET Midwest’s third Jet Edge system and JACQUET’s 13th Jet Edge waterjet nationwide. JACQUET plans to use the new system to provide beveling and chamfering services to its customers in the Midwest as well as nationwide through its five regional service centers. The waterjet system features a 21’ X 13’ work envelope which enables the metal service center to process full 8’x20’ or 10’x20’ plates. Its dual 5-axis cutting heads double their production and are capable of cutting precise 3D parts from virtually any material, including bevels up to 50°. Powered by a 60,000 psi 100 hp Jet Edge iP60-100 intensifier pump, the ball-screw driven waterjet system has the best repeatability in the industry at +/- .001”. The system also has submerged or above-water cutting capabilities as well as a proprietary plate mapping feature that allows precise nozzle-to-plate standoff. Chatterton noted that JACQUET has always equipped its service centers with large gantries to better serve its customers. When JACQUET decided to add a 5-axis system, it distinguished itself even further by offering the rare capability of dual 5-axis cutting services. A subsidiary of JACQUET Mid Atlantic, which is a subsidiary of Jacquet Metals of Lyon Saint Priest, France, JACQUET Midwest is one of five JACQUET metal service centers in the United States. The company also has service centers in Pottstown, Pennsylvania; Carson, California; Pineville, North Carolina; and Houston, Texas. JACQUET recently acquired the Rolark Group service centers in Canada, with subsidiaries in Edmonton, Toronto and Montreal. JACQUET specializes in supplying and processing stainless steel and nickel alloys for OEMS, fabricators and machine shops that support primarily the oil and gas, power generation, pollution control systems and water purification industries. JACQUET’s North American service centers provide waterjet and plasma part cutting. The company stocks 19 different grades of stainless steel and nickel alloy plates in a wide variety of sizes and thicknesses. For more information about JACQUET Midwest visit www.myjacquet.com/midwest or call 1-877-202-8911 or +1 262-898-1381. For more information about Jet Edge, visit www.jetedge.com, or call 1-800-JET-EDGE or +1 763-497-8700. Established in 1984, Jet Edge is a global designer and manufacturer of waterjet systems for precision cutting, surface preparation and coating removal. Jet Edge systems are used around the world in a broad range of industries, from the world's leading airlines to automotive, aerospace, industrial manufacturers, and machine and job shops. Jet Edge waterjets are proudly made in U.S.A.